Welcome JunglistGuy and thanks for your technical appreciation. Most don't know or forget that Heelo made a big leap forward with their app when they acquired NotifyM. The press release mentions leading software engineers in top technology companies. A hint, think of where the technology came from? Here is that press release over a year ago now. Heelo Coupons Inc. closes acquisition of NotifyM Technologies Inc.
Toronto, Ontario, February 16, 2018 - Heelo Coupons Inc., announces closing the acquisition of NotifyM Technologies Inc., of Toronto Canada. NotifyM has developed a proximity based mobile advertising platform available for Android and Apple mobile devices. The NotifyM platform was developed over the past 2 years by leading software engineers/developers with experience in top software technology companies who led development teams in three countries. NotifyM provides the best synergy in ad server technology and real-time reach in a single powerful platform. NotifyM uses Apple developed beacon technology to trigger the instantaneous delivery of promotions within a precise target field - based on location. NotifyM App users can navigate this user friendly App to turn it off or on, accept or decline offers, add retailers to favourite/ignore lists, share and much more. Thanks for the updates here guys, just been reading. I bought in $2 round too. I have done a lot of programming and on mobile apps too. What Heelo has is very very good and what sets it off is the power of the back end system. To tie it all together is a great accomplishment. This is leading edge and to come out with this in the early stages of the beacon market is a huge advantage. I am talking technology wise, but what I see with Heelo that is missing in almost all tech startups is a sales force. From what I gather sales out number techies 4 or 5 to one, this thing is going to go viral. Look out Twitter, Facebook, Instagram and such. GB, yes WiFI and GPS is old technology, not the future. I think Heelo will be very disruptive to Google. Heelo could own all the detailed space that GPS is not accurate enough to identify and geo-fence not good enough either. I see it that Google can own all the highways and streets, But Heelo will own the buildings. In city centers there is probably more traffic within buildings than outside. Ron, how I see it, WiFi is short sighted, it will not be long before mobile devices will have unlimited data plans and those people won't care and it will have to come with 5g. Heelo looks to be way ahead of the curve, because beacons can be specific about what info they provide. I imagine they will be very instrumental in a smart city, providing local information about shops, tourist attractions, events, traffic, directions etc. Gambler weird you mention this a week ago, or does FP read this topic. at the end of the article ""Canada has the potential to become a global centre for smart city development."" Nice additions to the team. Heelo bolsters team with two new sales executives, Marc Lapoint and Zain Ebrahim, along with veteran technology developer, Steve Cho..
Toronto, ON, Feb, 27, 2019 – Heelo Inc. welcomes sales leader Marc Andre Lapoint. Marc is bilingual french/english and has over 15 years experience in sales and marketing with the last 8 years in loyalty marketing. He is a team leader and has led sales with numerous companies. Most recently at Ackroo Canada as VP Sales & partnerships, leading a 11 person team, exceeding sales targets in 2015/16 and 90% of plan 2017. He was Owner – Consultant/sales at Evolve Automotive Group from 2012 to Jan 2017 for 25 various transportation industry businesses with an emphasis on Client Retention and Loyalty. Marc was also VP and director of Dealer Rewards Canada Inc. where his team grew the client base 45% adding over 55 dealerships to the Dealers Rewards program. He secured 3 national accounts with contracts in excess of $2.1 million. Marc's education includes Northwood University, Montreux, Switzerland and has a MBA (Honors) Degree, Master’s of Business Administration. He has been awarded MBA Management & Leadership Award for Excellence in Academic Achievement & Peer Support. Further more from September 2003 to June 2007 he attended the Canadian Automotive Institute, Barrie, Ontario, Canada with a BBA (Honors) Degree, Bachelor’s of Business Administration; Major in Automotive Management. Heelo welcomes, Zainul Ebrahim who brings with him over 20 years of entrepreneurial and investing experience in a variety of software and retail industries. He was jointly responsible for the selection of IT systems for the $300m Aga Khan Hospital in Karachi, Pakistan and has been an advisor on strategic technology initiatives to clients such as the City of New Westminster, District of North Vancouver, MacMillan Bloedel Research, and MacMillan Bloedel Port Alberni Operations (now part of Catalyst Paper) as well as on the conceptualization, design and implementation of technology infrastructure for North Shore Credit Union. He also simultaneously managed family owned real estate and two hotels in Alberta. Currently he serves as Vice President of Business Development for MasterFile, a developer of specialized litigation and case analysis software for smaller legal firms worldwide. Heelo welcomes, Steve Cho, a veteran web and mobile app developer with 25 years of software development experience for backend, mobile, and web applications. He has developed numerous well-known applications such as zoocasa.com and the City TV mobile app while at Rogers Communications Inc. The CityTV app was ranked #1 iPad app on the Apple store after it's debut. Additionally, Steve has helped many startups in building their initial applications, and has experience in scaling them up for larger user bases. Such as Property Insight as Lead mobile app developer and partner, also team lead and architect for Blackbox Loyalty. Mr. Cho completed a 5 year program at Myongji University in early 1990s and Business Administration at York University Toronto. In other news, Heelo signs first store in Florida, Silvers Edge of Fort Lauderdale which is a jewelry store.. It is within a plaza containing many other shops and is the first of many planned locations in Florida. Heelo is a leading location based marketing and advertising network that uses leading edge ping technology as an indoor positioning system to build its mobile audience, deploy SMB offerings and deliver advertising campaigns. Heelo is planning its commercial stage of development and growth after successfully engaging over 700 customers and 15,000 mobile users in early trials..
Heelo signs first store in Florida, Silvers Edge in Fort Lauderdale which is a jewelry store. This will be the first of many in Florida. It is within a plaza containing many other shops. Thanks DJ, hope I can pull that off for 2019. 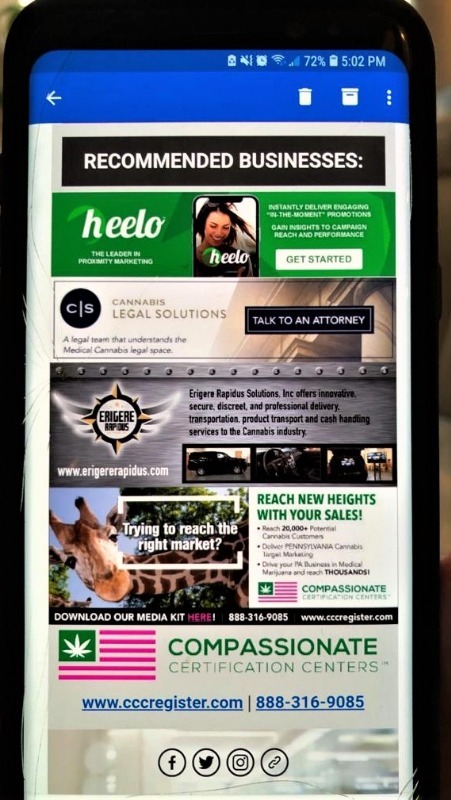 CCC the Cannabis company put this ad out today to their 1.3 million subscribers. The World Medical Cannabis Conference is end of March and I believe Heelo will be attending. CCC will be doing their 1st 10 installs of Heelo in the coming week or so.